Titled “Reaching the World 2013,” the conference was sponsored by the Bangkok Metropolitan Authority, Asia Books, and the Faculty of Arts of Chulalongkorn University. Bangkok had good reason to host us two years in a row; it had been named World Book Capital for 2013 by Unesco, and was celebrating the honor in the most appropriate way it could. It’s also at Bangkok’s historic Oriental Hotel that the annual SEAWrite Awards for the region’s best writers are given out, and we were welcomed there at dinner by the urbane and popular Governor of Bangkok, Sukhumbhand Paripatra. The son of a prince and educated at Oxford and Georgetown, the governor put everyone at ease by joking that he couldn’t greet us with rhymed couplets, as he was “only a politician” (he had, in fact, taught political science at Chula, Georgetown, and Columbia). I was one of the organizers of the conference, and was proud to see that a total of 27 Filipino participants (not counting four who had to withdraw at the last minute for various reasons) attended “Reaching the World.” Among others, the delegation included stalwarts of the Philippine literary community such as STAR columnist and former DepEd Usec Isagani Cruz; UST and UP creative writing guru Cristina Pantoja-Hidalgo; MSU-IIT professor and poet Christine Godinez-Ortega; DLSU creative writing center head Shirley Lua; UP Press director and poet J. Neil Garcia; University of San Carlos professor Hope Sabanpan-Yu; the Bellagio-bound fictionist Menchu Sarmiento; and Davao Writers Guild president Jhoanna Lynn Cruz. But more than seeing familiar names on the program, I was especially glad to see that many of our youngest writers on the UP faculty were able to attend as well, including Francis Quina (my deputy at the Institute of Creative Writing), Gabby Lee, Sandra Nicole Roldan, and Vyxz Vasquez. Conferences like APWriters expose writers like them to ideas and influences outside of their own local schools and networks, and sustain the continuity of our commitment to literature from one generation to the next. APWriters grew out of the old Asia-Pacific Writing Partnership, which we expanded to include translators, in recognition of their crucial role not only in promoting the works and careers of individual authors but also of fostering international understanding through literature. On top of the transition has been the indefatigable Australian writer Jane Camens, who now serves as APWriters’ executive director (read: conference busybody) and who put the conference program together from dozens of proposals we received. 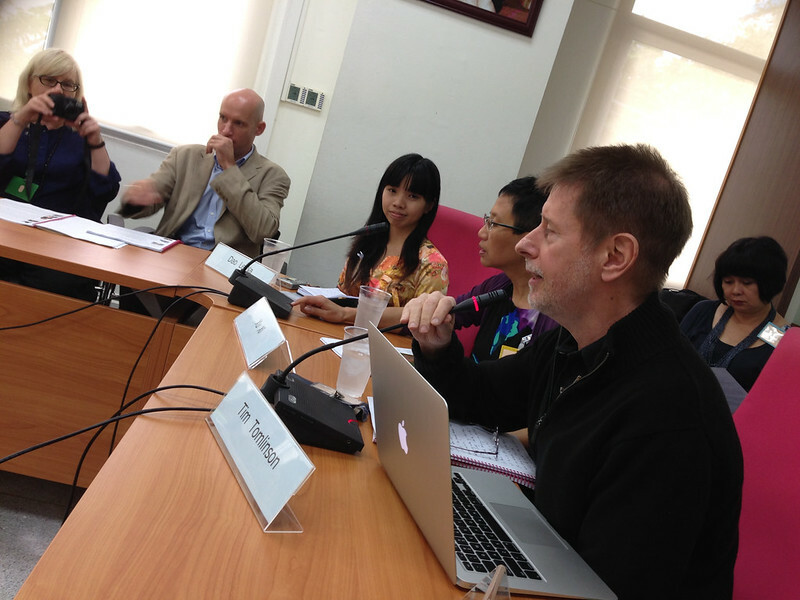 What distinguishes APWriters and its conference format is the informality of the discussions. Proposals for presentations were solicited and accepted, but no lengthy papers were actually read; instead, panelists spoke from notes or off the cuff, achieving our goal of witnessing “writers in conversation” as participants from places as diverse as Norwich and Ho Chi Minh City shed their academic robes, rolled up their sleeves, and spoke from the heart and from memory about the subjects that matter most to writers, translators, and teachers of creative writing. We don’t mean to be unfriendly towards critics, scholars, and their important work, which after all endeavors to make sense of what we creative writers do. It’s just that there are already enough venues out there for the reading of formal papers (the annual and massively-attended conferences of the Modern Language Association and of the Associated Writing Programs come to mind) on the most obscure and abstruse of literary concerns. I took part in two panels at Chula, as a discussant in the first (which confronted the question of “cloning” in writing workshops and programs) and a moderator in the second (which dealt with how writers budget their time, and with what else they do besides writing). Aside from Jane, I was glad to see old friends and acquaintances from around the region (or whose work and personal lives bring them regularly to Asia) such as the American writer and workshop specialist Tim Tomlinson, whose book The Portable MFA I’ve recommended to those in need of a crash course in creative writing; the Indonesian translator Eliza Vitri Handayani, who’d sponsored the translation workshop in Jakarta that I’d been a part of just the week before; Kate Griffin of the British Centre for Literary Translation; the Japanese-American fictionist Kyoko Mori, a fellow alumnus of the University of Wisconsin-Milwaukee’s PhD program; the Indonesian-Chinese-American Xu Xi, who directs the low-residency MFA program at the City University of Hong Kong; the Australian nonfiction and theater expert David Carlin; and, of course, the APWriters chairman himself, the Hong Kong-based Sri Lankan journalist and humorist Nury Vittachi, who’s been behind some of the region’s most significant literary projects, such as the Man Asian Literary Prize and the forthcoming World Readers’ Award. There were many more, but you get the idea: this is a functioning network of writers and literary specialists from around the Asia-Pacific who’ve come to know each other as friends. And before anyone starts screaming “Another literary cabal!”, let me say, yes, why not, because right now, that’s what we need; there will be a time and an occasion for principled disagreement, but for now our emphasis is on finding and strengthening commonalities of thought, practice, and experience, thereby creating a working community of writers and translators in the region. The large turnout from the Philippines also reflects the size and the maturity of our literary community and culture. Why shouldn’t we be able to send almost 30 writers to Bangkok? I respectfully disagree with those of us (including my friend Cirilo Bautista, whom I praised and quoted a few weeks ago) who see the Philippines as “a small country.” We’re certainly not—neither in size (at 300,000 sq. km., the same size as Italy), population (in 2005, we were 13th in the world), nor GDP (around 40th to 43rd out of nearly 200 countries, depending on the year and who’s counting). Our grossly inequitable incomes and power relations are a real problem, but even these haven’t curbed, and may even have encouraged, our expressiveness in art and culture. Indeed, as we look around the Asia-Pacific, we’ll find that the Philippines has one of the most robust of literary infrastructures, with formal creative writing programs in half a dozen major universities, a workshop tradition going back half a century, and the kind of democratic irrepressibility and irreverence that you can’t find anywhere else in Southeast Asia. We’re banking on these strengths to put the Philippines more firmly on the global literary map, and we’ve taken a step in that direction by offering to host (after Singapore next year) the 2015 edition of the Asia-Pacific Writers and Translators conference. I hope to see many of our Bangkok fellows there, and more. This entry was posted in Art & Culture, Education, Fun, Pinoys, Travel, Writing and tagged 2013, APWriters, Bangkok by penmanila. Bookmark the permalink.